We told you the other day that many Verizon stores would be opening at 7am or 8am EST on Friday morning to handle what is expected to be huge demand for the Motorola DROID on the day of its' launch. But if you live in New York, and you have to...just HAVE TO get your hands on the device as soon as the clock strikes midnight Friday, well, there is a store for that. 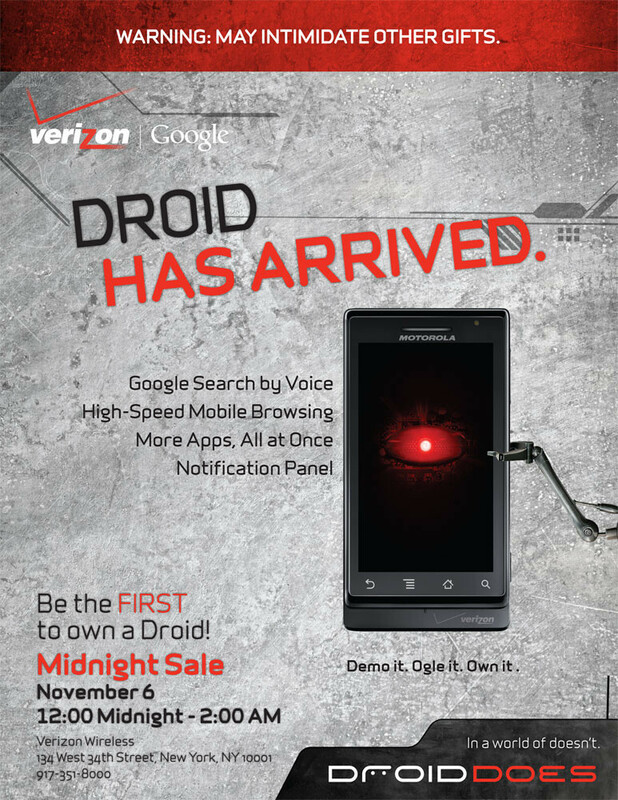 The 34th street Verizon Wireless store in Manhattan will be open for business at the stroke of midnight to sell the DROID to what we would expect to be a long line of early adapters. The store will be open from midnight until 2am. Any one else live by a store opening at midnight? Someone will have to be the first to buy the DROID. Maybe it will be you! Hype!!! Geez, you'd think this is like the release of Lord of the Rings IV. Funny thing is, they'll probably sell out. I wonder if this is the only store that will being this? This is a cool concept, and I hope other carriers do this with big release phones for us nerds out there. NY is the best place in the country. hell ya the snow is "hella" fun i lived in seattle washington for 2 years and i loved it but my home is in south florida what can i say. I just don't buy this prefabricated hype that Verizon is making for this phone. Sure, a lot of us tech geeks are excited about the launch of the phone, but I just don't think the consumer hype is there. I don't think there will be lines out the door in the way that there was for the initial iPhone launch...or to a greater extent, PS3 or XBOX 360. Sure, there will be a demand for them. But I also think the few folks who do want it the day of will have no problem walking in, getting the phone, and leaving. It's almost like telling people invited to your party that there will be a ton of folks showing up just so they think your party is the one to be at...even though it may not be. Using false hype to hype. I agree with you... though most of the previews/early reviews seem to think its a good phone with only a few minor issues. I am with you, waiting for christmas, verizon I guess is rolling out tons of phones. I'm really looking forward to playing with this phone. But will still wait and see what the actual reviews from the masses are like before I'd adopt. I also agree that I hadn't really thought of this phone as something like the original iPhone or other "prominent" consumer devices. But I guess last year, there were lines for the BB Storm, so why not this phone? At any rate, I doubt there will be any "run-of-the-mill" consumers in any kind of Droid lines; instead it's going to be a long line of phone geeks. I would of bought this phone but iam not a fan of qwerty keyboard it would of been awesome if it was a full virtual keyboard like the iphone. To my opinion that is a downfall everything on the phone is the best yet for verizon. Umm it has both the qwerty keyboard and it also has the touch screen full virtual keyboard in both landscape and ummm, that other view lol :) so you never have to slide the phone open if you don't want chief. It just gives the option using it cause it's there. Umm ... the virtual keyboard on the iPhone is a qwerty keyboard. He doesn't want a physical keyboard, like me. Why should I pay more for a feature I don't want? If moto would have a version of the DROID w/o the keyboard (droid) I would buy one as I still get the nice screen, but lose 1/3 the thickness a keyboard adds and extra weight. Exactly. Why would someone buy a phone with a keyboard if they don't plan to ever use it. I guess he can just glue the phone shut and pretend that it's not there.